Gam-cheon cultural village in Busan received the 2012 Asian Townscape Award from UN-HABITAT and the Asia Townscape Design Society. During the Korean War, soldiers who managed to reach Busan harbor were exceedingly fascinated by the beautiful nightscape lined with skyscrapers. However, the next morning they realized that the beams of light they saw were not from the buildings but from shacks on the hill. In those days, it was an area designated to be redeveloped with apartment buildings. But lately it is thought that establishing village communities, rather than building apartments, is the right answer for urban restoration. Gam-cheon cultural village in Busan is a typical precedent. This village is on an uphill road and it is intertwined with cramped, steep alleys, and houses. Surprisingly, visitor numbers to Gam-cheon village have been steadily increasing, attracted by the nostalgic scenery. Furthermore, young artists have visited the village and painted murals alongside the walls in the alleys. As a duck takes to water, cafes and galleries have started to appear. Every year, thirty thousand visitors have been coming to the town, and last July young participants in Unesco international work camps from 10 countries also visited the village. In addition, people from African countries, such as Tanzania and Uganda, called on the village to learn good examples of urban restoration. There has been another significant trial in Gam-cheon cultural village, which is publishing a town newspaper composed by the inhabitants of the village. Dong-seo university professor Myeong-hui Lee has contributed to not only publishing the local newspaper, but also to the design of the cultural village. “The key concept of Gam-cheon cultural village is to develop with preservation, rather than focusing on pure development. 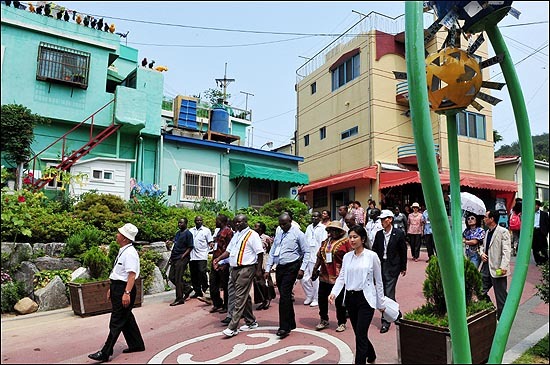 Gam-cheon can be a new symbol of urban restoration.“ He says. The above passage is quoted from Village Swaraj by Mohandas Gandhi. Gandhi stressed the importance of villages in his book. 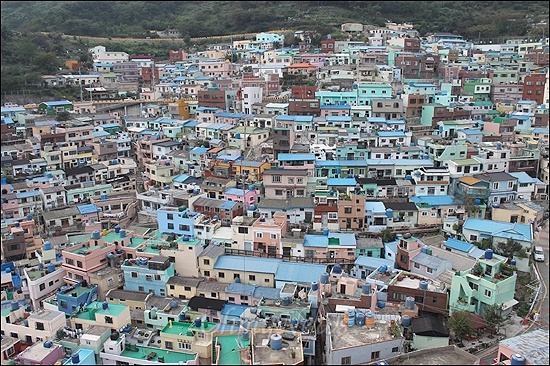 Nowadays, Seoul has also become devoted to developing village communities. OhmyNews provides relevant serial articles exclusively in this category. One of them is below. One can see very closely spaced shops such as clothing stores, snack bars, and fish and vegetable vendors within a bustling market, the Su-yu village market located in Gangbuk-gu, Seoul. This market is called a ‘village market’ since, like a village, it consists of three hundred fifty shops and over ten thousand people. Including the store owners and their employees, it has a floating population of 15,000 people. It seems like there are no great differences from an ordinary market, however a tiny library attracts one’s attention. How is it possible to have a library in a market? 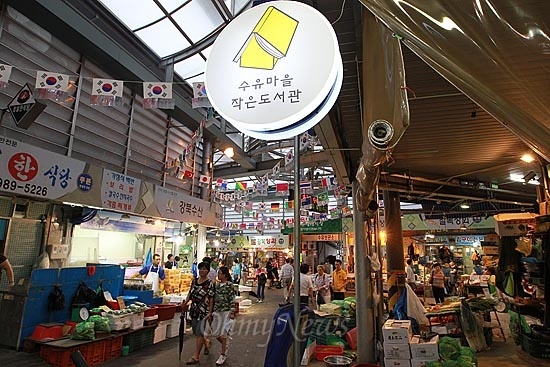 It has been managed by Jae-gwon Lee, who is a fish shop vendor. He has devoted a lot of time to devour books related to humanities. While exchanging the books with his neighbors, he realized that vendors were also eager to read books, and so he carried forward a plan for building a library with the Market Culture Vitalization Society’s assistance. There are a wide variety of subjects, such as literature, economics, social science and philosophy donated to the cozy library. ” I wanted people to realize that it is not true that vendors only obsess over money and have little knowledge,” Lee says. It has been one and half years since the library opened and also functioned as a gathering places for them to interact with each other. Furthermore, it is open to nearby residents, and library visitors can become market visitors, and have the potential to be loyal customers. According to Global Reporter, the state of Nevada has issued Google its first license to test self-driving cars on public roads. Though, I doubt you’d see them in Vegas any time soon. You know, citizen journalism does not always have to be about covering world shattering events or uncovering underground stories. 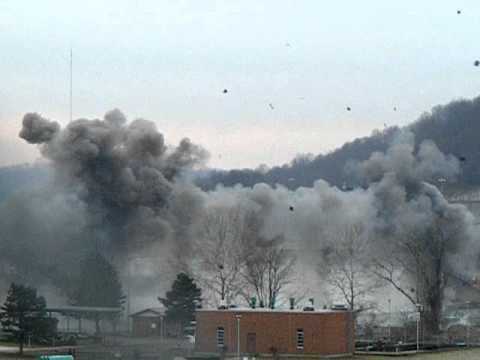 It can also just be a place to share something very, very cool–like this demolition of an 83-year-old bridge over the Ohio River. Here’s a cool idea for citizen journalists who cover local sports. Sports Reporting Technologies says its SportSiteWare gives citizens a way to write about locals sports and make a business out of it. Check it out at http://www.sports-reporting.net./. Maybe you can turn your love of sports into a great new business venture. It was only a matter of time for this advancement in agriculture, from plow to cotton gin to motorized tractor to–robots. Merinews reports on Mexican student Eduardo Rodriguez Hernandez’s robot prototype that can grow corn. So far it can do most of the work from seed to feed in many types of terrain, but it needs to be attached to cables at the moment. I, for one, welcome our robot corn-growing overlords.